Holly Scoggins, associate professor for Virginia Tech’s Department of Horticulture, trims a hops bine during the harvesting process at the Urban Horticulture Center in Blacksburg. Scoggins is leading research of the cultivars for hops that grow in the Mid-Atlantic region. Holly Scoggins recognized an opportunity while attending a 2014 workshop on growing hops. 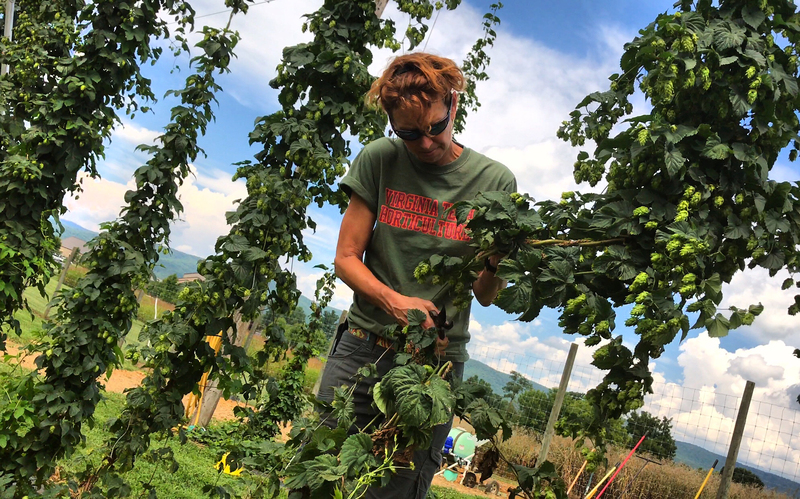 “Based on the all the unanswered questions surrounding hops in our region, it was clear Virginia Tech was in a position to help growers out,” said Scoggins, associate professor of plant and environmental science. 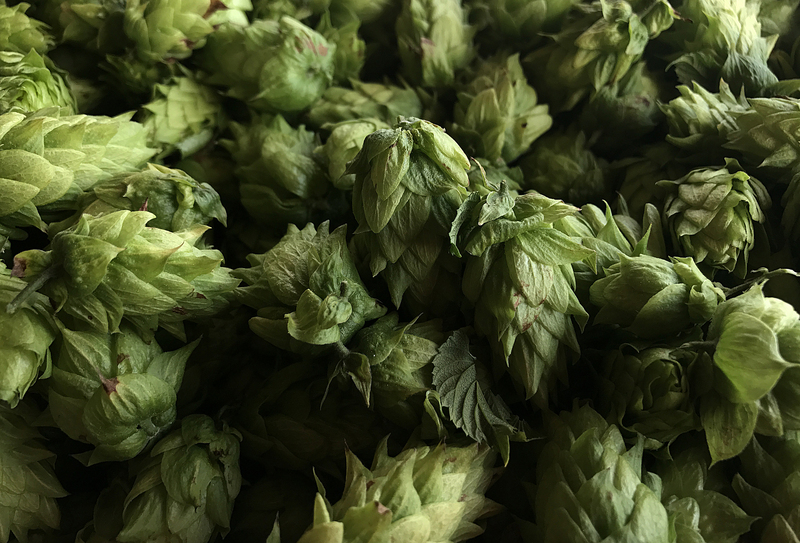 Although hops had been grown successfully in Virginia during the colonial era, the climate in the Pacific Northwest allowed that region to excel at growing the crop. The rise of craft brewing has helped reignite interest in the agricultural possibilities for hops in the commonwealth. Hop are labor-intensive crops that were successfully grown in Virginia during the colonial era. In 2015, Virginia Tech constructed its first hop yard, where Scoggins tested about 15 varieties to determine which could be nurtured to produce quality yields. The program has since added Research Manager Daniel Jackson and earned financial support from the Virginia Agricultural Council and the VDACS/USDA Block Grants. This spring, Virginia Tech hosted the Annual South Atlantic Hops Conference at the Inn at Virginia Tech, which was attended by exhibitors, speakers, and attendees representing 18 states. The program is slated to award its first hops-related master’s degree this spring and has already produced hops that have landed in some of the beers at Blacksburg’s Right Mind Brewing. “Scoggins Yard Ale. It was darn tasty, too,” Scoggins said of one of the brews. Currently, only about 30 acres of hops are grown in Virginia, according to the department’s latest survey. Short summer days and humidity are among the challenges local growers face, as are pests and downy mildew. Often, specialized equipment is required to turn the hops into pellets, per most brewers’ requests, and varieties are limited due to licensing agreements in the Pacific Northwest. Despite the challenges, Scoggins said she and Extension Agent Laura Siegle—a go-to authority on hops—rarely lack for people interested in growing. Currently, growing hops in the region involves a steep investment with a low return. The labor-intensive nature of the farming and the sales can make the endeavor unattractive to Virginia farmers. “But for someone with the right combination of growing experience, willingness to sweat, and marketing savvy, there is potential here,” Scoggins said. Scoggins and her coworkers at Virginia Tech hope to help reach that potential.